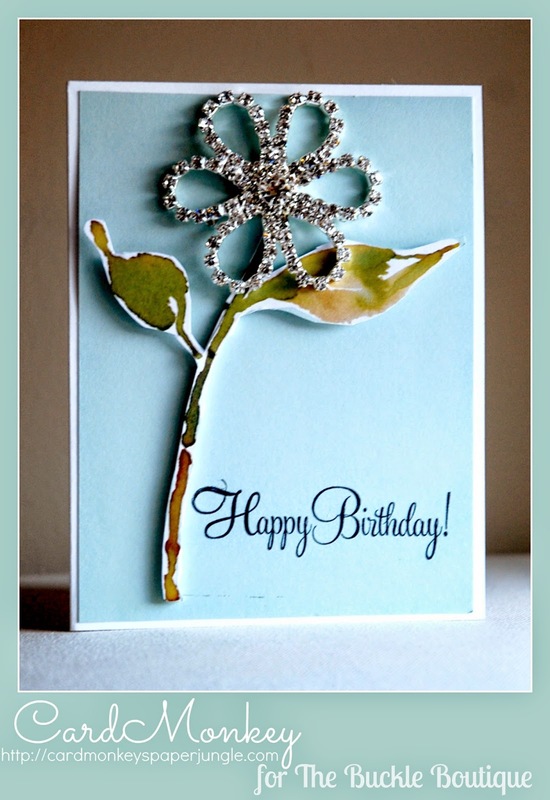 CardMonkey's Paper Jungle: TBB Friday: Gorgeous Daisy Pin as a Card Embellishment! TBB Friday: Gorgeous Daisy Pin as a Card Embellishment! Good, happy Friday morning, Friends and Followers! It is a beautiful day here in finally Springtime in southeastern Pennsylvania. Flowers are in bloom! We finally can see that light fresh green tint playing across the budding trees -- gorgeous, my favorite time of year! In honor of gorgeous Spring -- and celebrating her birthday of sorts -- I've made this lovely card using products from three of my most favorite suppliers: The Buckle Boutique, Kathy Davis Studios, and Close To My Heart. First up: that YES, it's a Brooch PIN from The Buckle Boutique! The beautiful daisy-shaped rhinestone pin is one of many inexpensive bling items you can purchase from The Buckle Boutique to dress up your cards, layouts, 3-D arrangements, and lapel! Imagine this lovely on a wreath full of them!! You may know that I have the privilege of serving on The Buckle Boutique's Design Team. My good friend Shawn Mosch is our team leader and she's done a terrific job of organizing us -- trying so hard with even me, the ultimate organization/planner disaster. With Shawn's scheduling prowess, you can look forward to seeing creations I've made for The Buckle Boutique posted here on my blog, and on TBB's social media sites, on the 2nd and 4th Friday of every month. This card also uses Kathy Davis Studios scrapbooking paper -- that's a piece of soft blue on the background, and the hand-trimmed leaves popped up under the flower. The sentiment is from a stamp set by Close To My Heart.